All are invited to join University UMC – Austin for their 4th Anniversary of affiliation with the Reconciling Ministries Network. Dr. Joretta Marshall, Executive Vice President, Dean and Professor of Pastoral Care at Brite Divinity School on the Texas Christian University campus in Fort Worth will be joining University United Methodist Church to celebrate our fourth Reconciling Ministry anniversary on Sunday, February 15, 2015. 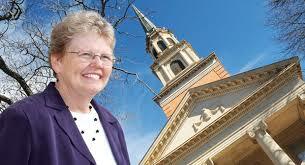 Dr. Marshall will be in the UUMC pulpit at the 8:30 and 11 A.M. services delivering her message.